To Cite: Safiri S, Haghdoost A A, Hashemi F, Amiri S, Raza O, et al. Association Between Adult Attention Deficit Hyperactivity Disorder and Helmet Use Among Motorcycle Riders, Trauma Mon. 2016 ; 21(2):e21066. doi: 10.5812/traumamon.21066. Background: Use of helmets plays a major role in preventing injuries or decreasing injury severity among motorcycle riders. Use of helmets may depend on personal factors such as psychological factors. Objectives: The aim of this study was to independently assess the association between helmet use among motorcycle riders and ADHD scores, with controlling the accident history and was taken more sensitive measures if helmet use was different between motorcycle riders, according to their ADHD scores. Patients and Methods: A cross-sectional study was done on 205 motorcycle riders referred to Kerman Referral Injury Hospital after a motorcycle traffic accident. Friends and family members possessing motorcycles who visited the patient in this facility were included in our sample. The Persian version of the Conner’s Adult ADHD Rating Scale (CAARS) self-report (screening version) was used in order to screen for adult ADHD. CAARS scores were compared between those who usually used helmets and those who did not. Results: Univariable analysis showed the mean of the age variable was significantly higher in the helmeted group, 26.94 ± 7.72 vs. 23.08 ± 7.7.32, (P < 0.001). The majority of the non-helmeted group was single (P < 0.001). Subjects with secondary educational level were more often in the helmeted group (P = 0.007). Daily and weekly driving hours were higher in the non-helmeted group (P = 0.002 and P = 0.004). Most of the subjects in the helmeted group had a driving license in comparison with the other group (P < 0.001). There was not a significant association between SES and having hyperactive children and helmet use (P = 0.159). In all ADHD subscales, a significant association was found and scores were higher in the non-helmeted group (P < 0.05). Nevertheless, multivariable analysis did not confirm the association of the ADHD screening score with helmet use. Conclusions: The result of this study did not find an independent association between ADHD and helmet use. Rapid socioeconomic development and use of new facilities and technologies have been adopted without social and cultural infrastructures. Moreover, such a prompt change in life patterns, regardless of the necessary assumptions for the acceptance of these changes, has led to a sharp increase in human casualties and psychosocial losses and has become a global problem. Nowadays, vehicle-related injuries are a major public health problem that has been neglected. An effective and sustained action is needed towards prevention. According to the World Health Organization, approximately 999,000 people died in road accidents in 1990, and that has been projected to increase up to approximately 12 million deaths in the year 2020 (1). Among road users, motorcycle riders and cyclists are considered high-risk users (2) and account for the most important causes of disability and death in developed countries (3). Besides the physical and psychological effects, these accidents impose heavy costs on society and families (4). Iran is one of the countries in the world that has a high mortality rate due to vehicle-related accidents (5, 6). Motorcycle riders are classified as a vulnerable group in Iran (7) and account for 42% of road accidents (8). The main risk factor for occupants of two-wheeled vehicles is not using a helmet. Wearing a helmet decreases the risk of head injuries and fatalities from 45% to 20%. It is considered the most successful way to prevent head injuries among drivers of two-wheeled vehicles (9). One study showed that the use of helmets in preventing head injuries among motorcycle riders and occupants is highly effective (10), and more useful in vulnerable motorcycle riders. Despite the importance of helmets in reducing risk, helmet use is low in many developing countries such as Iran. A study of Iranian motorcyclists conducted by Zamani-Alavijeh et al. (11) showed that only 10% of motorcyclists wear a standard helmet while riding. However, another 23% of motorcyclists used non-standard or partial helmets that covered only part of the head and did not prevent head trauma injuries effectively. Another study in Shiraz found that only 11.2% of motorcycle drivers always wore a helmet (12). Also, a study in Iran showed that helmet characteristics, sociocultural factors and personal and psychological factors are the predictors of helmet use (11). Some global studies and a few studies in Iran showed that ADHD was one the psychological factors that increases the proneness to accidents, and that accidents are associated with helmet use (13-16). However, the association between ADHD and helmet use is questionable and has not been independently assessed. The aim of this study was to independently assess the association between helmet use among motorcycle riders and ADHD scores with controlling the accident history and was taken more sensitive measures if helmet use became different between motorcycle riders, according to their ADHD scores. This study used a cross sectional design that originated from a case control study and was conducted on 205 motorcycle riders. Study participants were selected from the Kerman referral injury hospital. Kerman city is the capital and the largest city in the Kerman province and the most important city in southeast Iran. The population of the city in 1996 was 385,000 and in 2006 were 515,414. In 2013 the population was 621,374, including 312,873 male and 308,501 female. Friends and family members possessing motorcycles who visited the injured study patients in this facility were included in our sample. It is important to note that participants did not have an accident history. The duration of the study was six months, from June 21 to December 20, 2012. The sample size was calculated using one mean estimation formula. Statistical power and type one error were considered 80% and 0.05, respectively. Also, SD and acceptable margin of error were considered as 6.24 and 1.24, respectively. The required data for calculating sample size was obtained from a study that was done by Safiri et al. (16). Having a motorcycle, a negative history of road traffic accidents, lack of trauma due to a vehicle-related accident and ability to complete a Conner’s questionnaire were considered as inclusion criteria. Illiteracy and having an accident history were considered as exclusion criterion. 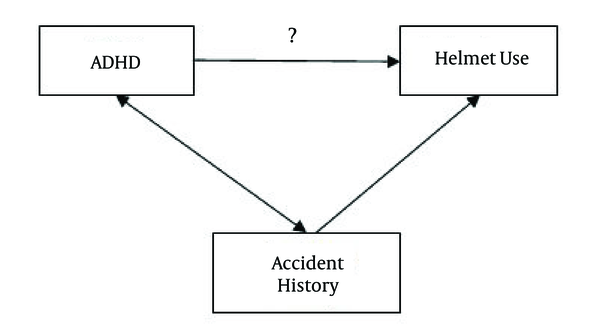 A history of accidents was considered as exclusion criteria, because that was the confounder and was controlled by the restriction method (Figure 1) (16, 17). A self-administered questionnaire was distributed to all subjects by nurses. The following factors were assessed in all subjects: D subscale (ADHD index), A subscale (attention deficit symptoms), B subscale (hyperactivity-impulsivity symptoms) and C subscale (total ADHD symptoms), having hyperactive children, psychiatric past medical history, age, marital status, educational level, daily driving hours, weekly driving hours, having a driving certificate, birth order and socioeconomic status (SES). SES was composed as a combined variable out of several related factors and aggregated to form the total SES score, in order to determine the socioeconomic status for each subject. The Persian version of the Conner’s adult ADHD rating scale (CAARS) self-report (screening version) was used for screening for adult ADHD. Its validity and reliability are in accordance with DSM-IV. Among its positive characteristics are having multiple indices, including the attention deficit index (subscale A), hyperactivity-impulsivity index (subscale B), ADHD total symptoms index (subscale C) and ADHD index (subscale D). Subscale C is the combination of subscales A and B. In the original reference manual of the CAARS, it is clarified which questions belong to the specific subscales, the scores of which were determined by adding the scores of each of the subscale questions. This questionnaire is considered as a standard measure for ADHD research (18). It has been translated to Persian by the clinical psychiatry research center (CPRC) in Tabriz, Iran and validated by Amiri et al. (15). In this study, the overall internal consistency of the Conner’s Adult ADHD Rating Scale was estimated using Cronbach’s α, which was equal to 0.83. The reliability and feasibility of the Persian version of this diagnostic instrument were already determined as fair to good for most diagnostic categories (Kappa > 0.6) (15). All statistical evaluation was done by SPSS version 21.0. In univariable analysis, according to the type of variable, t-test and Chi-square tests were used. In multivariable analysis, binary logistic regression was used. The significance level for this study was set at 0.05. The study protocol was approved by the committee of ethics of Kerman University of Medical Sciences. Written informed consent was obtained from all the study participants. The present study showed that helmeted subjects, in comparison to non-helmeted subjects, had higher mean age. In the non-helmeted group, subjects having marital status as single accounted for a higher percentage. Highly educated subjects were found more often in the helmeted group. Daily and weekly driving hours were higher in the non-helmeted group. Compared with the non-helmeted group, a greater percentage of people using helmets possessed a driving license. In terms of socioeconomic status, subjects using helmets had a better situation. According to the subjects’ birth orders; helmeted subjects were born significantly more in the first or second birth orders. The non-helmeted group had a higher frequency of having a hyperactive child in comparison to helmet users. Psychiatric past medical history was higher in the helmeted group. It is noteworthy that all of the associations in univarible analysis were statistically significant (P < 0.05), except two variables; socioeconomic level and having a hyperactive child. Some important variables are detailed in Table 1. In univariable analysis, four subscales of ADHD showed concordant results. In all subscales of ADHD, scores were significantly higher in non-helmeted groups (P < 0.05). With 10 score increments in all subscales, the odds of helmet use decrease significantly, up to 55% in a subscale, 56% in B subscale, 40% in C subscale and 49% in D subscale. Adjustment for all the significant variables was done. This showed that in all ADHD subscales (except A), with increasing ADHD screening score, the odds of helmet use decreased, but these associations were not significant. Table 2 compares the ADHD subscales among helmeted and non-helmeted users. a Adjusted OR, adjusted for age, educational level, marriage status, daily driving hours, weekly driving hours, driving certificate, birth order and history of psychiatric referral. b Odds ratio is calculated by 10 score increments in ADHD subscales. In the present study, the associations between ADHD, using four subscales, and helmet use were assessed. The scores of all subscales were higher among non-helmet users as compared to helmet users (subscale A, 9.61 ± 4.80 vs. 8.10 ± 3.96; subscale B, 10.13 ± 5.64 vs. 8.12 ± 4.31; subscale C, 19.74 ± 9.24 vs. 16.22 ± 7.59; subscale D, 12.87 ± 6.59 vs. 10.38 ± 5.66). Our literature review could not find any study specifically studying the association between ADHD and helmet use. Barkley et al. showed ADHD young adults were cited more often for speeding, were more likely to have had their licenses suspended, were involved in more crashes, were more likely to have had crashes causing bodily injury and were rated by themselves and others as having poorer driving habits (17). A study by Zamani-Alavijeh et al. (11) showed that psychological factors are the determinants of helmet use. A study done by Asha and Najafi (19) showed, using a psychological behavior model, that one of the influential factors for using a helmet among bicycle riders was psychological factor, but ADHD was not considered specifically. Also Gielen et al. (20) investigated psychosocial factors associated with helmet use among bicycle riders and found significant associations. Studies have generally considered the relationship between psychological factors and helmet use. All of the mentioned studies have indicated that psychological factors have a significant association with helmet use. The current study is the first to report from Kerman, Iran on the association between Adult attention deficit hyperactivity disorder (ADHD) and helmet use. Univariable analysis of the present study indicated that there is a significant negative association between ADHD and helmet use. Subjects with high scores of ADHD screening had lower odds for helmet use. Motorcycle riders with low attention, hyperactivity and impulsivity had significantly lower odds for helmet use. It seems that subjects with low attention consider using a helmet would increase their inattention and limit their hyperactivity. In multivariable analysis, significant associations transformed to non-significant associations. This indicates that the studied variable must be considered as a confounder, but for clarifying the association, further studies are needed. The present study indicates that there is a significant association between ADHD screening scores, in terms of its four subscales, and helmet use in univariable analysis. Although multivariable analysis does not assure a strong and independent association, it alerts the researchers to reassess the possibility of such an association, and conducting future studies with a large sample size in various contexts and settings is recommended. We thank all those who helped us to conduct this research project. Authors’ Contribution: The study design: Homayoun Sadeghi-Bazargani and Ali Akbar Haghdoost; clinical recommendations: Shahrokh Amiri; writing the first draft: Saeid Safiri and Homayoun Sadeghi-Bazargani; management the data collection: Saeid Safiri and Fatemeh Hashemi; analysis of the data: Saeid Safiri; visiting and evaluating all patients: Fatemeh Hashemi; the project coordinator and responsible for data collection: Saeid Safiri; revising of English version: Owais Raza. All authors commented on the final manuscript and provided critical revisions. Financial Disclosure: The authors declared no financial interest. Funding/Support: This study was funded by the vice chancellor of research and technology of Kerman University of Medical Sciences.